There are about a dozen different images of this idea shown on the post I googled. Bet you could find others. BTW - this is an example for me of how crazy the patent system can be. One overly broad patent would nuke all these devices today. The patent filing would be a diagram of a dude in a field with his ear cupped. They still look like musical instruments. Anyway, the acoustic mirrors in England look just plain weird. In the early stages of WW2 there was an emplacement in Washington DC near American University, that used similar technology. 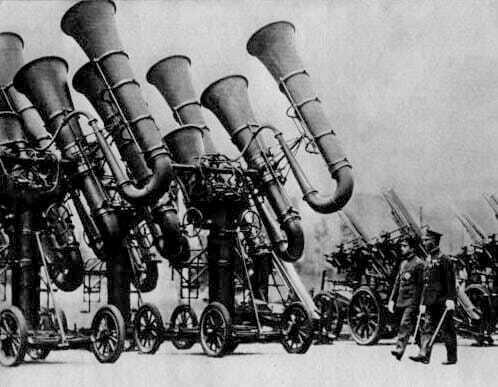 It had three large parabolic cups to listen for incoming bombers. I doubt they were very effective either for us or the Japanese. At a time we had few victories and something that looked so strange and impressive was a morale builder.